NEW PRODUCT – SEGGER J-Link EDU – JTAG/SWD Debugger « Adafruit Industries – Makers, hackers, artists, designers and engineers! NEW PRODUCT – SEGGER J-Link EDU – JTAG/SWD Debugger – Doing some serious development on any ARM-based platform, and tired of ‘printf’ plus an LED to debug? It’s USB based and uses a high-speed MCU internally, not an FTDI convertor like most low cost debugger. More debugging, less waiting! It just works, and keeps on working, and it’ll be there for you in several years time. The J-Link is fast. Stepping through breakpoints and reading memory addresses is quick, as is programming the flash memory on the chips. It’s real strength, though, is that it’s so vendor and tool neutral. Most chip vendors today provde low cost (or free) tools, but they also lock you into their chips and force you to accept the choice they’ve made for you. 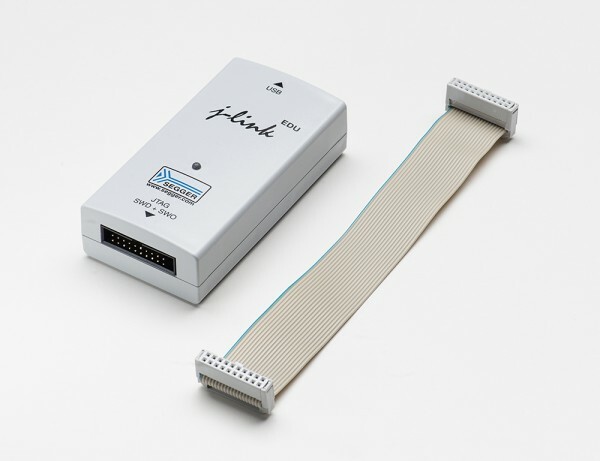 Segger’s J-Link is a nice change in that respect, since you can be reasonably certain it will work with any chip, in any major toolchain, and you’re free to change camp (or OS or IDE) without having to buy a new debugger every time. Your chip might be ending up in the HardFault handler, for example, but without a debugger it can be very hard to trace back exactly what is causing the problems. A debugger allows you to set ‘breakpoints’ in your code, where execution will temporarily stop, and you can check the value of memory or peripherals at that point in time, and then ‘single-step’ through your code line by line, executing your program until you find the place that causes your fault. There’s a lot more to debugging than simple breakpoints, but you can often solve in a few minutes with breakpoints what would take much longer with printf and instrusive blocking mechanisms you insert into your code without a debugger. 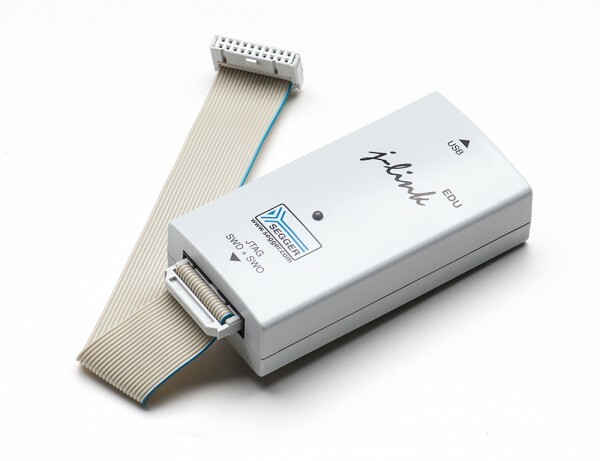 Whether you’re using GDB Server (GNU Tools) or an IDE and a commercial toolchain, it’s also just a big convenience, since the J-Link can program the flash for you at the click of a button, reset the device, start execution, and then ‘halt’ on main(). You can do all these steps yourself — programming the device via free tools over UART or via a USB bootloader, etc. — but when you need to do that 40-50 times a day, it can get old quick, and 15 seconds saved make a huge difference when debugging. You can program a small MCU and break on main in 2-3 seconds with a J-Link, which makes the tools more or less invisible, which is a good thing when you have other problems to worry about. I’m curious what sets this ons apart from BusBlaster ? It clearly has some onerous licensing limitations, so what technical merits does it have over BusBlaster ? Options are good, and you need to make your decisions based on your own specific requirements and priorities, but I’ve tried to highlight the thought process behind offering hte J-Link below. The key advantage to me is that the J-Link works with absolutely everything. They have on-chip flash programming algorithms for any chip I’ve ever come across, they get new chips supported before they’re available, even from the smaller vendors. It just works, each time, every time (and on rare cases where it doesn’t they tend to fix it quickly). It works in every major IDE, both commercial and anything open source that uses GDB. I love open source, but sometimes commercial tools like IDEs have their place as well, and sometimes you need to pick the right tool for the job to meet your deadlines and budget. 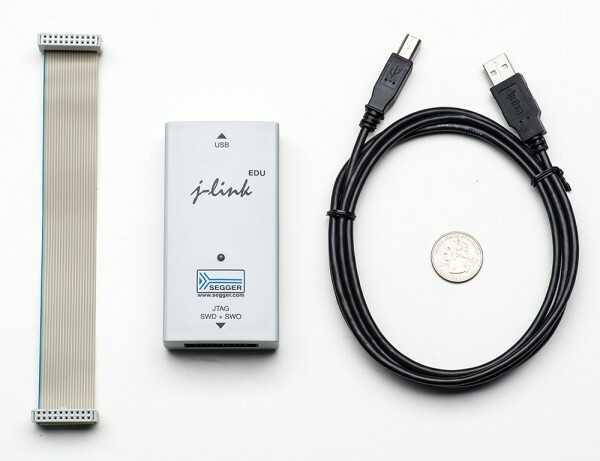 The J-Link has you covered in absolutely every situation, and it’s the only real ‘one-ring-to-rule-them-all’ solution I’m aware of (GDB, Keil, IAR, Crossworks, AtmelStudio, yada yada). I’ve never tried the bus blaster, but (from long experience with about 30 ARM debuggers here) the FTDI chips are often a huge bottleneck, and the main reason you’ll find a J-Link on the desk of 95% of working embedded engineers using ARM is that it’s extremely fast. When I was working at NXP, we had every conceivable debugger in the closet, but they all tended to gather dust, and the J-Link is what say on everyones bench. Those are just my own thoughts, and I’m admittedly a big fan of the J-Link (I have not one, not two, but four!) … but having tried them all, I’m still confident that on technical merit and price/performance, the J-Link is the best choice you can make for a long term solution of buying the right tool once. I didn’t hesitate to pay full price for one since I use it commercially, but if you can fit within the (fairly generous) EDU terms, it’s a good deal for the time a good debugger saves longer term.